The Esther Cohen Gallery is pleased to announce the purchase of two new works from Heffel Fine Art Auction House. These new pieces add vibrancy and depth to an already well-rounded collection – we hope you enjoy them as much as we do! 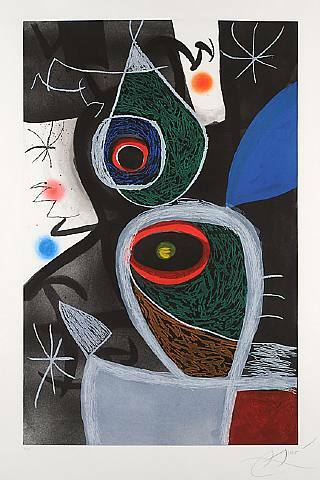 Joan Miró and Alexander Calder both experimented with colour, shape, and lines, relying primarily on these elements to explore compositional space. While they worked independently, they have created a body of work that complements each other both thematically and visually. Joan Miró was a world renowned Spanish Catalan painter, sculptor, and ceramist born in the sea port city of Barcelona in 1893. Miró was the son of a watchmaking father and a goldsmith mother, and was exposed to the arts from a very young age. As a young man, Miró decided to devote his life entirely to painting, studying at La Lonja School of Fine Arts in Barcelona. His works around this time reflect the influence of different trends, like the pure and brilliant colors used in Fauvism, shapes taken from cubism, influences from folkloric Catalan art and Roman frescos from the churches. From 1929-1930, Miró began to take interest in the object as such, in the form of collages. This was a practice which was to lead to his making of surrealist sculptures. He also experimented with many other artistic forms, such as engraving, lithography, water colors, pastels, and painting over copper. What is particularly highlighted from this period, are the two ceramic murals which he made for the UNESCO building in Paris (The Wall of the Moon and the Wall of the Sun, 1957-59). From the 1960’s to his death, he concentrated more and more on monumental and public works. He concentrated his interest on the symbol, not giving too much importance to the representing theme, but to the way the symbol emerged as the piece of work. Alexander Calder was born in 1898 in Philadelphia, the son of Alexander Stirling Calder and grandson of Alexander Milne Calder, both well-known sculptors. After obtaining his mechanical engineering degree from the Stevens Institute of Technology, Calder worked at various jobs before enrolling at the Art Students League in New York City in 1923. In 1925, Calder published his first book, Animal Sketches, illustrated in brush and ink. He produced oil paintings of city scenes, in a loose and easy style. Early in 1926, he began to carve primitivist figures in tropical woods, which remained an important medium in his work until 1930. 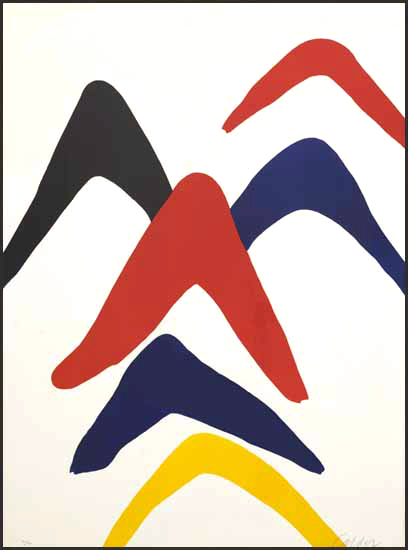 Calder began to work in an abstract style in 1931. Calder’s abstract works are characteristically direct, spare, buoyant, colorful and finely crafted. He made ingenious, frequently witty, use of natural and manmade materials, including wire, sheetmetal, wood and bronze. Later, Calder began to create large-scale outdoor sculptures and a series of mobiles – for which he is, perhaps, most renowned. Calder, who has proved prolific in many art forms, died in 1976. For more information on the Esther Cohen Gallery Collection, please visit our website.